Some of you might have noticed the first scam wave last week when a bunch of HYIP’s stopped paying. A year has just begun and let’s see what kind of programs it will bring in the following weeks and months. Last week was just a reminder of the unpredictable nature of the industry. Sure, it might have been coincidence, but I believe there are many admins that have a clear goal in mind when they stop a program while others stop their programs because of the lack of cash flow. 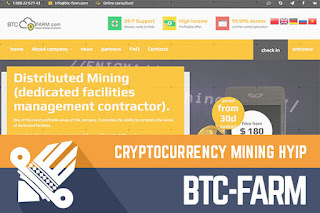 Today our main topic is mining because I’m going to review a HYIP called BTC-FARM. It joined Sticky Listing on DavidNews.com monitor on the 27th of January. The program has been online for 6 days in total. As you can see it hasn’t even reached yet the age of one week. What should we expect from this program? At first glance, it’s a mid-term program with interest rate from 2-4% (initial deposit included). Now I have reinvested in this program $200 and will keep you updated with the payment status information. Keep reading to find out more about BTC-FARM. As usual, let’s look at the overall information regarding the investment plans. There are five investment options available for “Cloud Mining” with 2.1 up to 3% daily for 50 up to 100 days and twelve “Dedicated Miners” options with 3.05% up to 4% daily for 35 up to 100 days. It looks to me that admin has tried hard to make investment plans complicated and hard to understand, but once you are inside in an account everything is simple and clear. Only thing that you should know right away is that at first you will need to fund your account balance and only later you will able to choose investment plan that suits your needs. I must admit that the website of BTC-FARM is a mess. Even though, I’m a not a native speaker, many of the text fragments on this website don’t make any sense to me. I assume that content has been automatically translated from another language. After the first load of the website, it opens in Russian and once you change it to English you can see that each page first is loaded in Russian and only then text changes to English. It takes a 1-2 second to load it. BTC-FARM has 5 language options available – Chinese, English, German, Russian and Vietnamese. Not sure about other 4 languages but English most likely is a robot translation. This already gives me an impression that admin was in a hurry. Of course, we need to look at the legend, which you already might know from the Eco-Hash. There are many random facts about BTC-FARM business approach, but the main point is that it’s about mining. We all know that there is such industry out there and some people are and will be making money while cryptocurrency rates are high. Unfortunately, the translation was very poor and very generic. In case you still have some questions about the BTC-FARM HYIP there are several communication forms available. First, phone number. Please drop a message in case you tried to call BTC-FARM. Online consultant – unfortunately, nothing happens when you click on this button on the website. Third, email address. The program also has a Facebook group and VKontakte social media profile with 260 members. BTC-FARM is almost a week old HYIP. In fact, their profile on Vkontakte has been active since the 3rd of December 2017. Investment plans are not transparent from outside and the website lacks investment calculator. Worth mentioning that a similar website with only slight changes has been out there before and it was scammed within 30 days. BTC-FARM investment plans have minimum 33 days break-even point, which can’t be reached in case this program will have the same lifetime. Therefore, if you ever decide to make any investments, don’t invest more than you can afford to lose! Have you already made an investment in BTC-FARM and have any useful information to share with us? Please drop a message in the chat box to share your experience! Investment plans: Cloud mining - 2.1% up to 3% daily for 50 up to 110 calendar days, initial deposit included in the payments. Dedicated mining - 3.05% up to 4% daily for 35 up to 100 calendar days, initial deposit included in the payments.